Nut lovers rejoice! 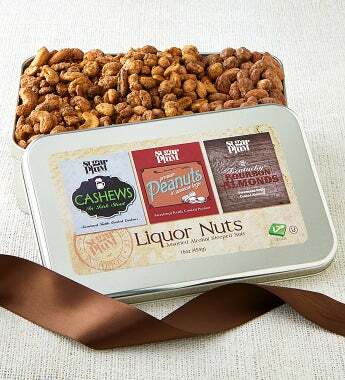 The Trio of Liquor Nuts Gift Tin contains three delectable flavors that are an absolute taste sensation. Addicting and sweet, but not too sweet! Sugar Plum's unique twist on classic bar snacks will revolutionize nut snacking. This 16 oz. assortment of mouth-watering, hand-crafted Irish Stout Beer-flavored cashews, Jamaican Lager Beer-flavored peanuts and Tennessee Whiskey-flavored almonds will leave you begging for more! Nut lovers rejoice! The Trio of Liquor Nuts Gift Tin contains three delectable flavors that are an absolute taste sensation. Addicting and sweet, but not too sweet! Sugar Plum's unique twist on classic bar snacks will revolutionize nut snacking. This 16 oz. assortment of mouth-watering, hand-crafted Irish Stout Beer-flavored cashews, Jamaican Lager Beer-flavored peanuts and Tennessee Whiskey-flavored almonds will leave you begging for more!